Eater is coming so close! These little nests make great gifts for the children’s teachers and are perfect for kids’ parties at any time of the year- just decorated with sugar sprinkles, or even mini eggs during Easter season. You can also press the mixture into one large round tin and then top with marshmallows and a few candles for a bigger birthday cake. This is one recipe that you can happily let the children make by themselves – but be prepared for lots of messy hands and faces! Perfect for when the kids are around during half term or school holidays – you can keep them occupied with a fun activity and they will love eating the results of their hard work. 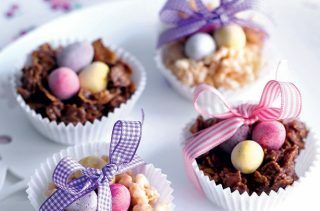 These chocolate cornflakes recipe works well with Rice Crispy too, so you can experiment with various cereals and see which ones you and your kids prefer to make these yummy chocolate nests.